Seventy-five years ago, 15 professionals from the petroleum industry met for the first time as the American Society for Training Directors, which eventually evolved into the Association for Talent Development (ATD). Throughout ATD’s 75th year, we have been celebrating the vision and mission of this group with talent development professionals in our local community and around the world. As ATD celebrates its 75th anniversary, we can think of no better time for our chapter members to join or renew their national ATD membership. member discounts in the ATD Store. If you have questions about how ATD membership has benefited professionals in our area, please feel free to reach out to Sallia Bandy, the chapter’s VP of Membership. You can also check out this video to hear what talent development professionals from around the world have to say about ATD, and how the association has supported their professional development. Join the monthly Member Mondays webinar to learn more about the chapter. Click on the Events tab and register for Member Orientation, held the last Monday of each month. Thank you for your continued engagement with the ATD Austin chapter, and we hope you’ll consider taking advantage of this special opportunity to join or renew as a Power Member. 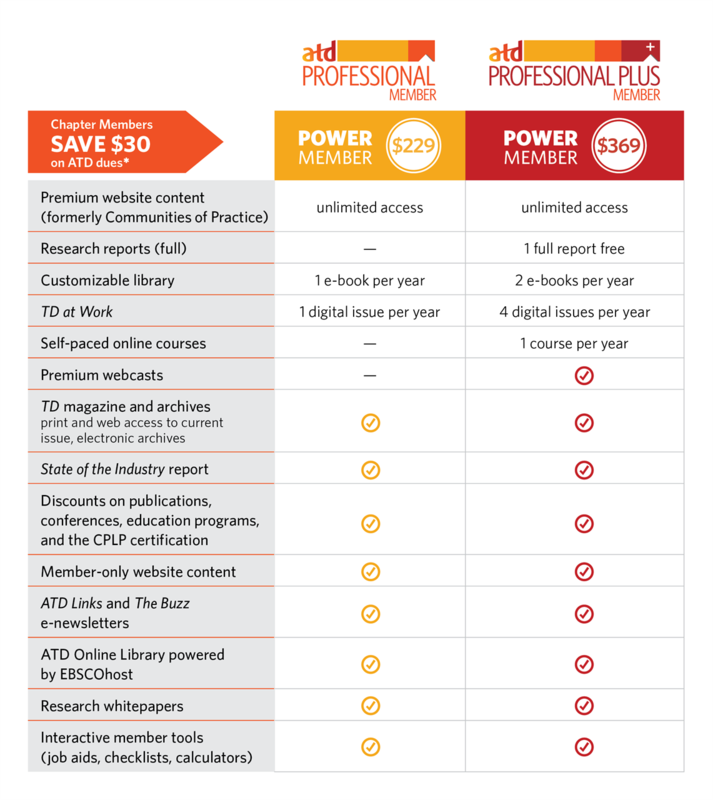 To join ATD and become a Power Member, visit the ATD membership page and click on Join ATD with one payment! Current ATD Austin Chapter Member and Not an ATD National Member? ATD Austin Chapter members may join ATD at a discount. Get the discount online at www.td.org/membership by using the Chapter ChIP code CH7059. Join via phone at 1.800.628.2783 (Monday-Friday, 8 a.m.-6 p.m. ET) and mention the Chapter ChIP code CH7059.